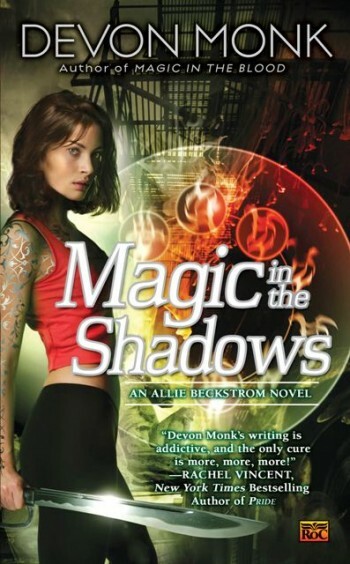 There is especially one character in Magic in the Shadows that I want to point out. In Magic in the Blood Allie managed to bring alive a gargoyle. Stone, the gargoyle, is a wonderful “pet”/”friend” for Allie. Our block-building dude. I love him. Another one is Shame (Shamus Flynn), our self-destructive but ever so loyal friend. I don’t know why, but characters that get into “trouble” are incredibly fun. Shame is the prankster of our trio/quartet. Zayvion has a larger part than the other two – naturally. He is Allie’s second half (so to speak). A lot of the Allie Beckstrom series describes the growth that these two characters go through (well the rest of them as well). Monk manages to give us characters that grow and she explores human nature in all its glory and horror. Allie’s problems are not over. The voice in her head is not helping her at all. As the series is told in 1st person, we get to view all of Allie’s incredibly dense moments, but also those moments when she gets to show what she is good for. The Authority is very interested in getting Allie to deal with the voice in her head. They feel threatened by it. But it comes in useful when Allie has to fight with a magically created “demon”. Allie’s ability to store magic in her bones is a phenomenon no-one quite understands. Her lack of ability in controlling her magic makes it necessary for her to get help – through the Authority.